I don’t know if the name for this affliction is procrastination–hey, it wouldn’t surprise me in the least, she says, eyeing the sinkful of last night’s dishes–but when I need to get things done, I have this bad habit of doing them either right-that-very-moment or pretty much never. When I return from a vacation, I either get every single thing out of that suitcase and into its proper closet or hamper within twenty minutes, or it sits on the floor of the bedroom for weeks, as it has since we’ve returned from Charleston. I return a garment I’ve changed my mind about the very next day, or it sits in a bag, as has a certain Banana Republic blouse, for six (cough, eight) months, my husband looking pointedly at it and then back at me often enough that I just downright ignore that too. Once something leaves my short-term memory, it may as well be lost for good, but in recipes at least, today I am on a rescue mission. You know, I’ve never been one to malign vegetables or healthy food, but I think that’s exactly what’s happened here. I don’t dive into posts about them the way I do with cakes, frosted, sprinkled, rolled, yeasted, basted, braised and pressed things; the more everyday stuff always ends up backlogged, and then accidentally forgotten. And it’s a shame, because if I had more of this Mediterranean Eggplant and Barley Salad right now, I’d eat it for lunch and then dinner again. Cubes of eggplant and zucchini are roasted until nicely caramelized, all the while pearled barley is absorbing spicy broth, and then two are tossed together with red onion, Kalamata olives, fresh mint, parsley, cherry tomatoes and mixed with a lemon vinaigrette. Hearty, healthy and so much more complex in flavor than one comes to expect from whole grain salads, I am pretty sure we’ll be coming back to this all summer. I have done you a disservice by not mentioning this for two weeks, as you could have have already eaten it twice! Maybe even four times! Tsk-tsk. I assure you, a lesson has been learned. The next two recipes are Hot Off Teh Blogs, which means I got them from someone who probably doesn’t take months to get around to sharing their finds with other like-minded cooks. Hashed Brussels Sprouts With Poppy Seeds from the Union Square Cafe Cookbook via Molly as well Luisa. Though pan-browning is our usual favorite way to eat these little nutters, that took about 10 minutes beginning to end should not be overlooked. 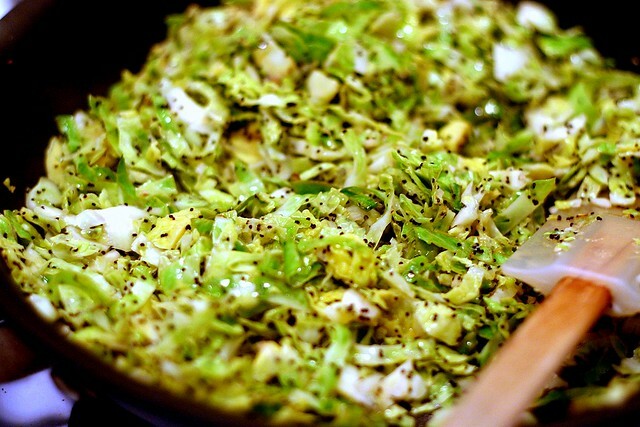 Slices of brussels are sliced and sautéed like the cabbage they are with lemon juice, olive oil, a garlic clove, poppy seeds and then briefly simmered in white wine or vermouth. I’m a sucker for anything speckled, and coupled with their bright lime-green tinge, this dish is a perfect late-winter reminder of the brighter days ahead. I’m not sure why I never mentioned making Heidi at 101 Cookbook’s Roasted Cauliflower Popcorn–did I just not like my photo? (Wouldn’t be the first time.) I liked the dish, however, um, which is really what this is about. Growing up, we always had cauliflower with bread crumbs, but this is perked up with a hot pepper and two cloves of garlic. Still, it stays on this of mouth searing side of spicy, due to those fresh bread crumbs and the caramelized edges of the cauliflower. By the end of the winter, when you’re about as sick of the readily-available produce as one can get, there’s no time like the present to find a way to innovate, and both this cauliflower and those brussels did the trick. As always, thanks be to Molly, Luisa and Heidi for the freshest of fresh ideas. Roast eggplant and zucchini: Put oven racks in upper and lower thirds of oven and preheat oven to 425°F. Toss eggplant and zucchini with 5 tablespoons oil, 3/4 teaspoon salt, and 3/4 teaspoon pepper in a bowl, then spread in 2 oiled large shallow (1-inch-deep) baking pans. Roast vegetables in oven, stirring occasionally and switching position of pans halfway through baking, until vegetables are golden brown and tender, 20 to 25 minutes total. Combine vegetables in 1 pan and cool, reserving other pan for cooling barley. Cook barley: Heat 2 tablespoons oil in a 3- to 4-quart heavy pot over moderately high heat until hot but not smoking, then cook scallion, cumin, coriander, and cayenne, stirring, until fragrant, about 1 minute. Add barley and cook, stirring until well coated with oil, 2 minutes more. Add broth and water and bring to a boil. Reduce heat and simmer, covered, until all of liquid is absorbed and barley is tender, 30 to 40 minutes. Remove from heat and let stand, covered, 5 minutes. Transfer to reserved shallow baking pan and spread to quickly cool, uncovered, to room temperature, about 20 minutes. Make dressing and assemble salad: Whisk together lemon juice, garlic, sugar, and remaining 1/4 teaspoon salt, 1/4 teaspoon pepper, and 3 tablespoons oil in a large bowl. Add barley, roasted vegetables, and remaining ingredients to bowl with dressing and toss until combined well. Serve with cheese slices. Do ahead: Salad can be made 1 day ahead and chilled, covered. Return to room temperature before serving. Wow! This looks spectacular. But I was wondering (even if it seems an elementary step) whether you might include the roasting directions. Your bit about “cubes of eggplant and zucchini roasted until nicely caramelized” made this salad sound fabulous. I think I might make it tonight! Oops, that accidentally got cut when I re-jiggered the recipe. I will add that graph back now. Thx! Those sprouts are good indeed, but tell me, did you make them with poppy seeds or mustard seeds? Having recently come face-to-face with a badly cooked version of them (so sulfur-y, I almost winced), I’m happy to be reminded of such Brussels sprout perfection! That salad looks great, especially for light weekend lunches. And the cauliflower popcorn? 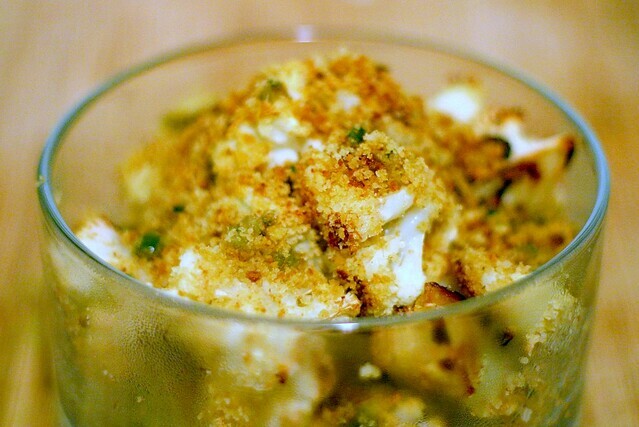 I never thought I’d have cravings for cauliflower, but this is fabulous. Came over from Elise’s Simply Recipes. I love grainy salads, and that one looks great! Thanks for sharing the recipes. I love those Hashed Brussels Sprouts – it’s become a Thanksgiving staple for us. And it does truly make a convert of people who claim to hate brussels sprouts. 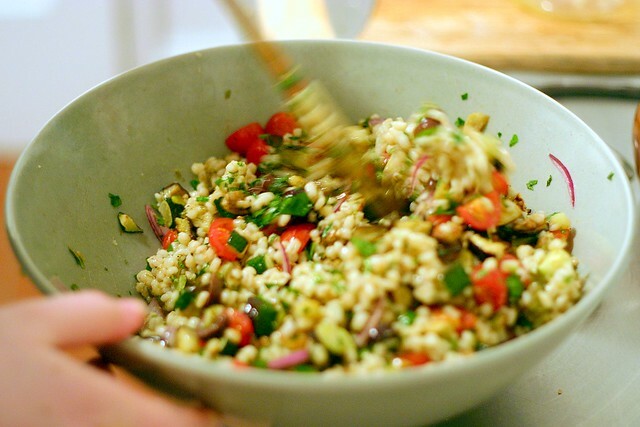 The barley salad looks wonderful…is it a good disguise for eggplant, which my husband professes to loathe? I guess IÃ‚Â´ll just have to try brussels sprouts again once I see them available fresh. I have always been a brussel-sprout hater, but you even made me try fennel seeds and I liked them like that, so anything is possible. And I understand about forgetting to post healthier recipes, I do the same… there must be something about some dishes that makes them seem less exciting than a great sweet recipe, but I must say that I for one find this kind of recipe quite inspiring, so keep them coming. This barley salad is going in my to-cook list, it sounds perfect for hot days and IÃ‚Â´ve seen some lovely zucchini lately. Hey, I am so with you on the just-can’t-bring-myself-to-unpack-for-weeks thing. What’s up with that, anyway? I think, for me, returning from a trip must send me into some sort of dream state where I imagine I have a ladies maid. Oh well. Going to figure out how to print out these recipes efficiently…Thanks. First time to comment here I think, but I come often to see the AMAZING pictures of the recipies you make. I was inspired to comment by your first paragraph about either doing things RIGHT NOW or pretty much never. I’m the same way. Sometimes I get home from a vacation and unpack immediately. After our last vacation in January I didn’t unpack for more than 8 days (or was it two weeks?). I’m so glad I’m not alone! Is the eggplant cubed skin on? or peeled? Deb, I love barley salad. Our favourite recipe includes roasted corn and is dressed with a cilantro-chipotle pesto. It’s fantastic, especially chilled. As a huge fan of eggplant, I look forward to trying this Mediterranean version. I’m loving the hashed brussel sprouts, looks like a great way to appreciate them! I am definitely trying the salad and, if I have time, I’ll try the b. sprouts. THey are my fave veggie these days! I’ve made that cauliflower, too, and it’s fabulous. The brussels sprouts are calling my name. I was scrolling down the page and that speckled goodness stopped me in my tracks! Thanks for the barley salad post, Deb! I love barley (so much that I’ve emailed rob for his cilantro-chipotle dressing version!) and this looks like it could go to a cookout and hang out for a while on a buffet table none the worse for wear. Can’t wait to try it! Made the barley salad this weekend. Absolute winner, we ate it 2 nights in a row. Your photography is fabulous! I was just thinking this morning that I buy way too many cookbooks and never make anything in them – I enjoy imagining that I will make the yummy things pictured. Your blog just might save me a bundle! The pictures just make me feel healthy looking at them. Will try it out after my workout at the gym tonight. Keep up the good work, I know it’s hard! 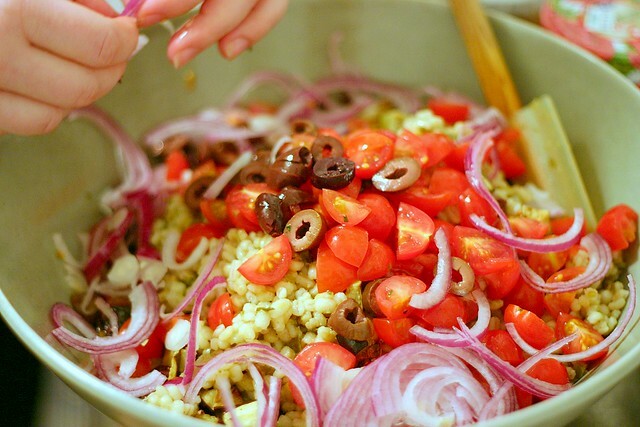 I just made your barley salad and it was so amazingly scrumptious! Thank you for your wonderful recipes and lovely pictures! I made this for dinner tonight and it was fantastic! I substituted quinoa for barley, shallots for red onion, and cilantro for parsley–it was a hit. Deb, I’ve followed recipes from your site for three out of the past five meals that I’ve cooked. I owe you an enormous thanks for making my kitchen a happier place. Hi Deb! I’d love to make this tomorrow without having to go to the store! What would be the best substitute for the barley (because I’m out! ), wheat berries, bulgar or quinoa? holy yum!!!! i made this last night and can’t stop sneaking into the fridge to take bites of the leftovers. its absolutely delicious! i made a few changes tho – it calls for a LOT of EVOO, and I reduced it to about 7-8 tbsp but i still feel as though its very oily, so next time i make it i will reduce even more. the fresh herbs add so much flavor to the dish, do not skimp on them! the flavors intensify overnight, so it may be useful to make a night ahead of time. i add feta to my bowl whenever i eat it, and it definitely adds a little something extra. will definitely be making this over and over! Delicious. I made this last weeked for a potluck. Thank goodness I thought to double the recipe and keep one batch for us at home. I made a few changes. I wanted the dish to be vegetarian and didn’t have vegetable broth so just used water to cook the barley. I almost doubled the coriander (by accident, I read the wrong line in the recipe) and added a bit more cayenne. I also only added half the scallions to the cooking liquid. I cooked the zucchini and eggplant on different pans so I was able to use less oil (the eggplant needs a fair amount when roasting, but the zucchini need much less). I roasted the red onion as well. At the end I added the remaining half of the scallions for a mild oniony crunch, used oil cured olives chopped fairly finely, and upped the proportion of lemon in the vinaigrette and added an extra half batch of dressing. This turned out magnificently. Hearty but light and flavorful, almost like the stuffing in dolmas. Like the last poster, I added feta to my home batch and it’s a nice addition. This is going to become a regular in my house. Yum! I made this last night (minus the zucchini), and we really enjoyed it. It was especially good for something that sounded so “healthy,” and by grilling the vegetables outside we also managed to avoid heating up our kitchen in the summer. Our only issue was the quantity– it’s huge! I think it would have served 6 as a main course at our house, and we’re not light eaters. Fortunately the leftovers will make good lunches, but we still could have done with a little less of them. We’ll certainly make it again, but in a smaller batch. I went to the farmers market today and came home with eggplant, zucchini and tomatoes and found this recipe…happened to have some mint and the other ingredients…and I used Kashi 7whole grain pilaf( has barley in it, in addition to oats, brown rice, rye, buckwheat, sesame seeds, etc which by the way always takes me double the amount of liquid they suggest…but it’s really yummy) instead of just barley since I had some already….just finished it and gave it a taste and it’s delish! What simple ingredients yet such complex flavor when all combined. It’s all ready a few hours early for dinner…I’m sure it is one of those salads that tastes even better w/ a bit of time. Thanks for another colorful, flavorful and also quite healthy dish! I love it and I have enough for lunches tomorrow! oh…I meant to mention that since I used the kashi blend instead of the barley, I omitted that oil (2tbs) as my grains didn’t call for it.. and I didn’t quite use 5 tbs for the roasting…so I prob. finished up using 6-7 tbs total. turned out beautifully! Oh and PS, I’m serving it up with some Quorn fillets (and a homemade tomato sauce to juice those little babies up). Have you ever used this stuff? I’ve just been introduced to it, and am impressed! Made this last night. Loved it! Only suggestion is to use less parsley as it can be overpowering. MY favorite food blog is right here. I just found your blog and linked to your recipe through my blog so my followers may find you as well. I am so excited to try this recipe! I was pondering how to quicky use the gorgeous little eggplants and skinny zucchini that jumped into my cart at the grocery, so I checked your blog and of course you had a great recipe. I’d already made tabbouli, so left out the parsley. Used 2 cups couscous soaked in 2 cups chicken broth since I didn’t have barley. Didn’t add any salt as the couscous and olives were plenty briny. The result was Oh My, This Is So Good! I was looking for a side dish to serve with some shrimp this week, and this fit the bill. It’s both a grain and has veggies in it, so I didn’t have to make anything else. I was a little hesitant after reading all the steps, but it was so worth it! It was absolutely delicious. I skipped the parsley, mint, and raw onion and it was still fantastic. I added a little bit of extra lemon juice and I couldn’t stop eating it. The flavor of the spices in the barley were tasty but not overpowering and the roasted vegetables were simple and melted in my mouth. Normally I love eggplant but hate the seeds, and I didn’t even notice them once the eggplant was roasted. I’d make this again. It’s even great as a vegetarian lunch or snack. I just made this and will serve it to my book group tomorrow — my initial tasting confirms it’s going to be wonderful. I used quinoa instead of bulgar. I found this in your recipe list under “eggplant.” Later I was looking for the recipe under Salads and it isn’t there. I know later I’ll be looking for this recipe again — if you would also put it in your Salad list in your index, I’d really appreciate it! Carolee — Thanks, done! Glad you liked it. I ran into your website a couple times a year or so ago, and now it’s all I need for an amazing collection of recipes that perfectly matches my families palate. I think I love you! Thank you so much for taking the time to take great pictures and write up detailed directions for what you’ve made. Yum! Made this today for a nice warm-weather weekend dish. Sampled some (because I HAD to) and it’s perfect! Love the idea to add spices to the oil for sauteeing the barley. Love this salad. Made it for my BF and his parents this week. They all were in love with it, but I couldn’t let my future mom-in-law know where I got it. I told her it was a family recipe :) But I would email her the recipe. Great step by step with fantastic pictures. Thanks a lot for helping me impress the future family. This was delicious and surprisingly quick and easy. I used pearl cous cous and greek feta, and topped it with rocket. Perfect summer dinner fare. Heard about this website from NPR and I just tried this recipe, had no scallions so substituted leeks. It was quick, easy to prepare and divinely delicious. I am looking forward to trying more of vegan recipes from the Smitten Kitchen. Just made this tonight and I LOVE it! This is going in the regular dinner rotation! I omitted the mint and added fresh baby arugula. A great choice! Soooo just made this along with your garlic butter roasted mushrooms and some butternut squash soup (thank the lord it’s Fall!). This salad is AMAZING. I have no other words. I also added diced fresh mozzarella to add some richness…mmmm. Thank you for this great recipe! I will definitely make it again for my friends. Made this with quinoa. So good! Thanks. Forgot to say, no parsley and not enough mint in the house so I subbed a cup of chopped arugula and 3/4 cup chopped basil leaves which was fantastic! I just made this and it’s a winner! Used wheatberries instead of barley, and extra lemon juice! LOVED it. This was delicious. I subbed Israeli couscous for the barley, and fried haloumi for the ricotta. SO good. I’ve made this recipe for a few years now, just thought I would comment on my variations: I usually actually leave out the eggplant and make zucchini according to this recipe: https://smittenkitchen.com/blog/2007/08/my-favorite-side-dish/. It turns it into a one-pot dish, which is great. The olives are also really key for the salt balance; if you leave them out or have less, be sure to add salt. I just made this salad. I’m not sure what I did wrong but my zucchini and eggplant totally turned into mush. Anyone have any ideas on how to prevent this next time? The salad has great flavor but the texture of the eggplant is a little mushy! Would love any suggestions to improve my cooking skills! Emma — Both vegetables are soft when cooked, always. Keeping them in small cubes (the 1/2-inch recommend) and roasting them well helps them maintain as much structure as possible, though. Made this yesterday and had it again for lunch today. I added chickpeas to it, and would do it again. Topped it with feta b/c I couldn’t find ricotta salada. I thought at first glance that the dish would taste too oily/wet/slippery, but once the parsley was mixed in, it ended up being great. I still might reduce the oil next time to get a more dry consistency. Either way – loved the dish! Would feel great about serving this to guests, and I’ll eat it again myself. Great adaptable recipe. One recommendation for added depth of flavor – toast the barley in the oil before adding the stock. It should smell toasty and turn brown (not burnt). One of my all-time favorite recipes. It’s a weekly staple for us during the summertime. The first time I made it, I used barley as directed but both my husband and I agreed that semi-pearled farro would be more to our taste. I substitute it in the same quantity and it works great. It makes more like 6 full servings for us, but we always want leftovers because it’s delicious. We top with feta instead of ricotta salata because we found the ricotta salata to be too salty for us. Without any cheese and with vegetable broth, it’s a great vegan potluck dish. We’ve always gotten rave reviews! Is the eggplant peeled or unpeeled? I also made this with farro, and it’s deeeelish! I added some chopped red pepper to the bowl to give it a nice crunch. Definitely on the make-again list! I have made this recipe several times and it is fabulous! One time I substituted quinoa because one of our guests has a gluten allergy and cannot eat barley. It was also wonderful. The only change I made was to use slightly more dressing but that is more of a personal preference and not a criticism.